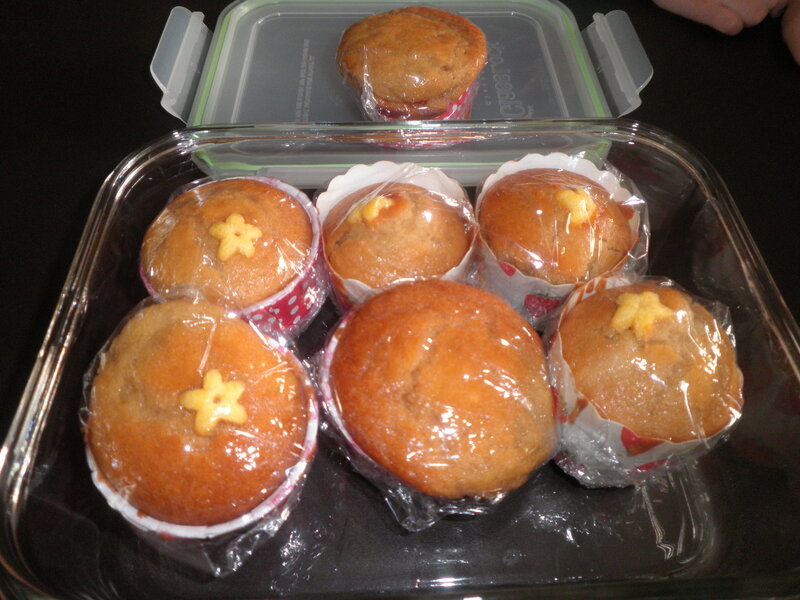 I used the mini two tier tiffin carrier that she bought for me from Haadyai, Thailand. 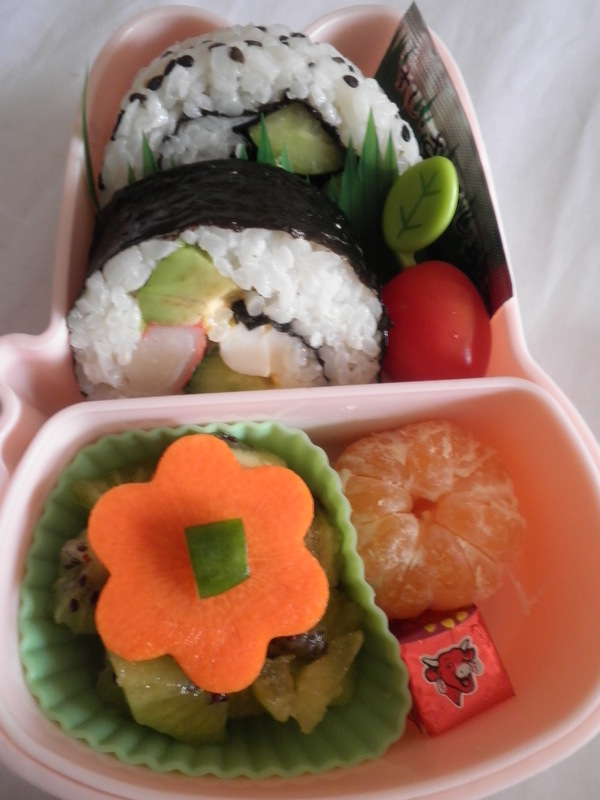 It’s a right size for lunch and it looks cute too because of its size. 😀 On one tier is the main i.e. 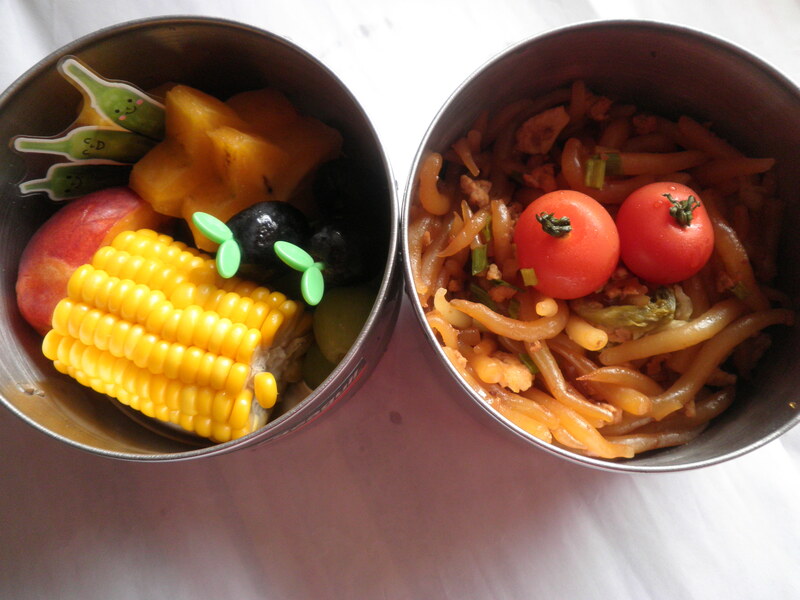 the noodle with two mini tomatoes and on the second tier, I have star fruits, corn on cob, and some grapes. Can you see the green chilli baran? 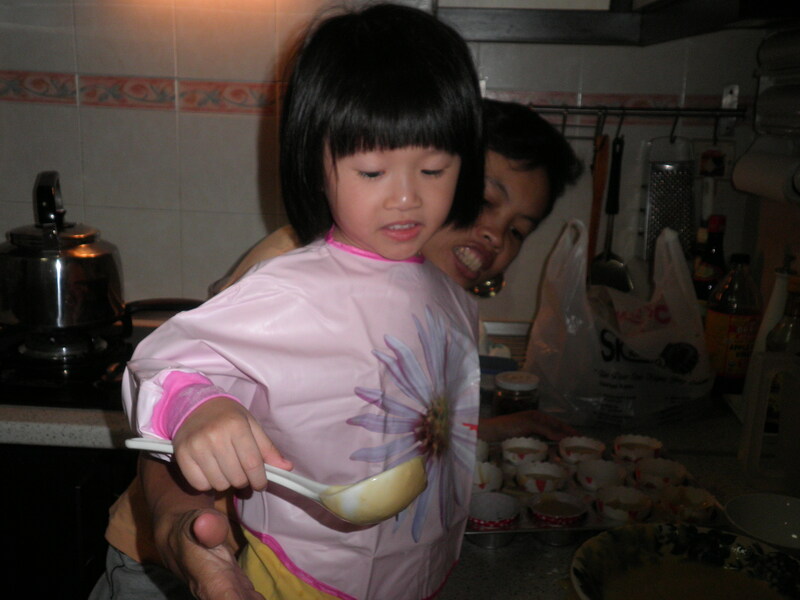 Its so cute, right? I bought them at Daiso!! I still have not gotten to making a Christmas theme bento and Christmas is this weekend!! Ahh….. I actually made these on Monday but only have the time to post it up now. Over the weekend we went to “The Loaf“, a bakery founded by my ex-CEO together with our country’s ex-premier, Tun Dr. Mahathir. Besides their bakery goodies they served up some nice meals too at the little cafe in their Pavilion outlet. So while waiting for our lunch to be cooked, both my little girl and I went down two flights of stairs to the smell of heavenly pastries. 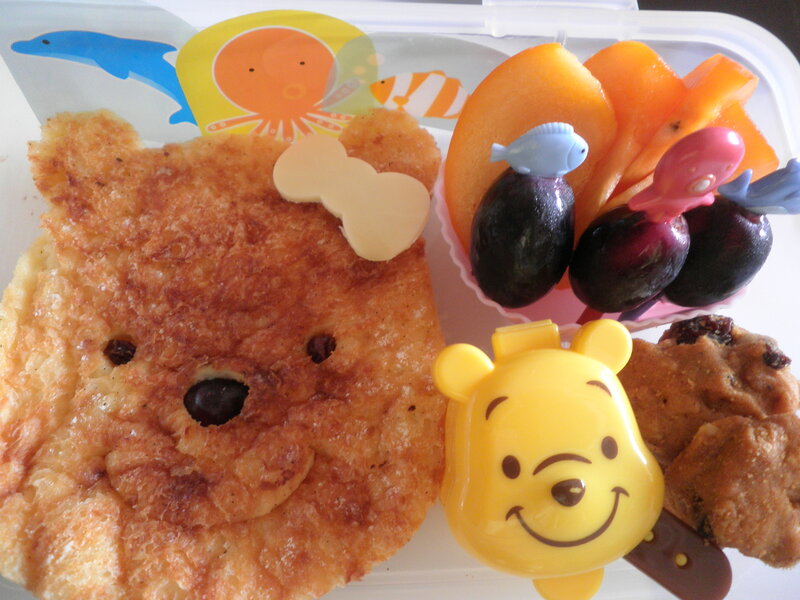 And here in my bentos are two of their goodies, the french toast which I cut into a Pooh Pooh face and the basil chicken bun that I made into a little mouse. I used sea animals picks and baran trying to creating a sea-side feel for Pooh Pooh. And for hubs I gave his “Mousey” a little cube of Laughing Cow cheese and put them all in a garden environment. 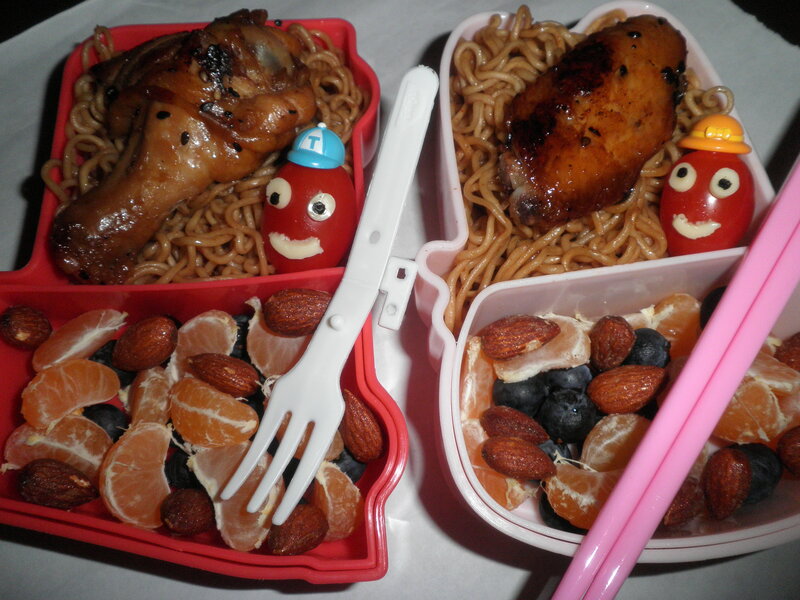 Besides, the heroin and hero of the bentos, the sides are just some persimmon slices and grapes. Oh and I had three tiny pieces of oatmeal raisin cookies from Famous Amos! 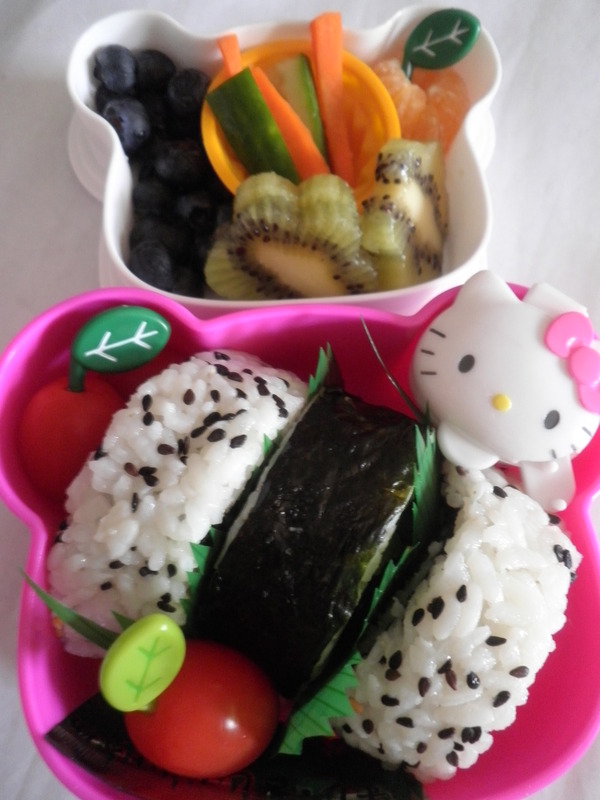 I made these bentos yesterday morning but did not have the time to post them up. Anyway, made two, one for myself and another for my sis who had been asking for one for quite awhile already. I made and froze a few teriyaki chicken wings earlier, so for these bentos I had them in together with some “Mee Goreng” a.k.a. instant fried noodle as the main. I didn’t have any vegetables although it would have been great to have some spring onions if not for nutrient but for colour. 😀 On the small compartment I made a blueberries, tangerine and almond salad. And the star of these bentos are my cocked-eye tomatoes couple. Didn’t realise they were cocked-eye until I saw these pictures now. Haha! 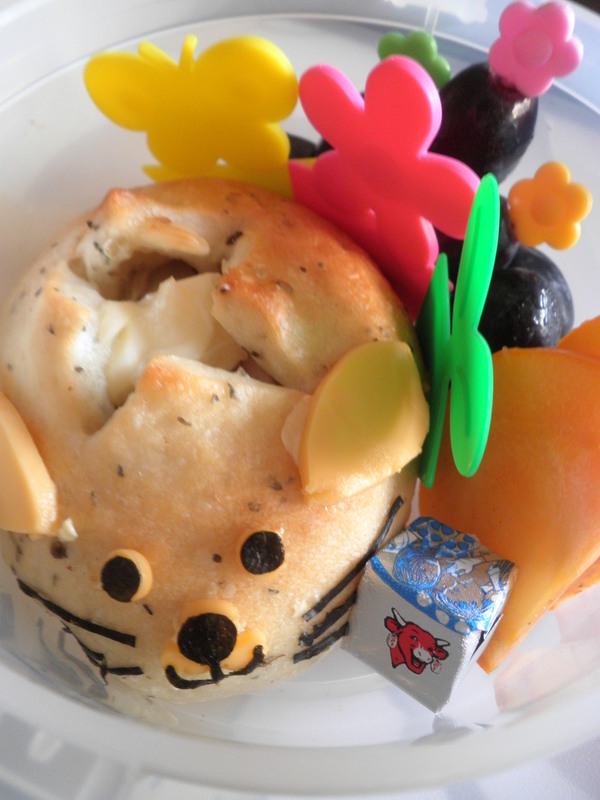 I found these little bagels while doing some “window shopping” at the supermarket and I was so thrilled with the finding coz its just the nice cute size for my little girl. Need not cut the normal biggie bagel into two which will then limit the creativity in making bentos for her. Plus, its whole wheat! I bought a huge bag of them and since I have got a lunch appointment today its also a right size for my breakfast! Haha! 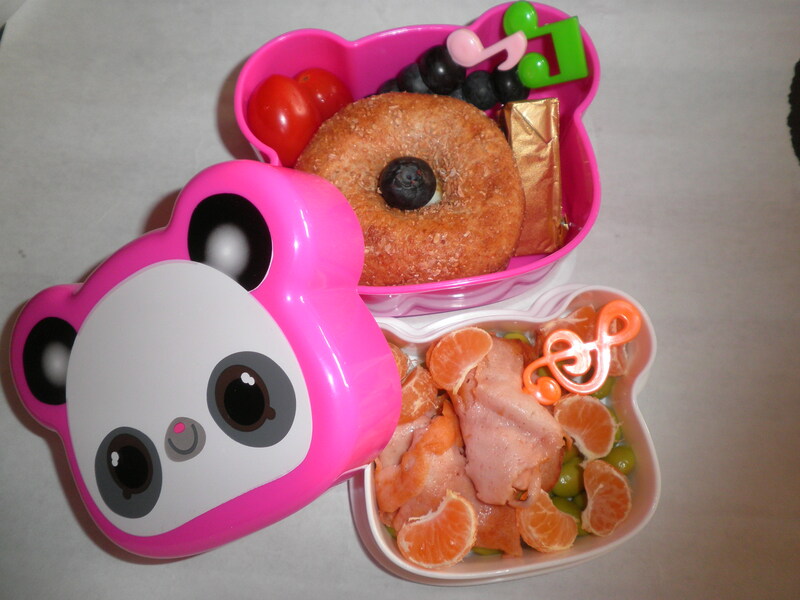 The star of this morning’s breakfast is not just the cutey bagel but also my bento box! I bought this in September during my trip to London and have yet to use it until now. Isn’t it kawaii? And the best thing is that it can fit my cutey bagel in it and leave space for other yummies. If it’s the biggie bagel, it will just fill up the entire tier! The box is divided into two tier one shallower than the other. 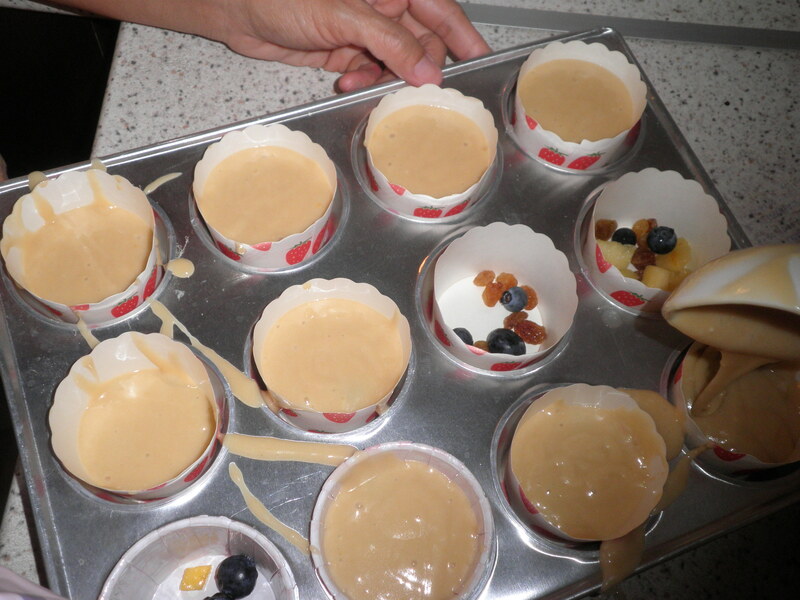 The shallow one, I filled it with edamame, tiny tangerines and some slices of luncheon meat. 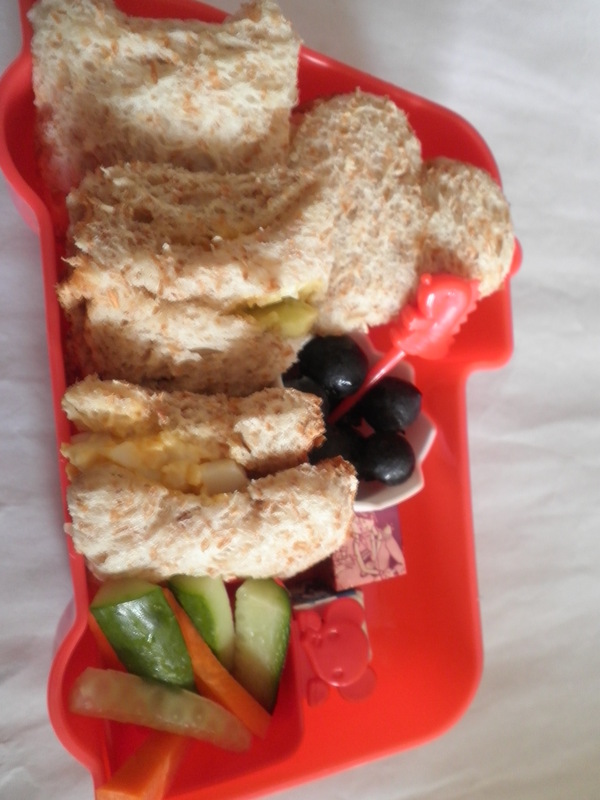 In the deeper tier is my cutey filled with egg, two cherry tomatoes, blueberry musical skewers and a Laughing Cow Salmon Cheese Wedge. Oh! I have just gotten another new box too! And this time it really was a worthwhile buy as it was purchase for charity! 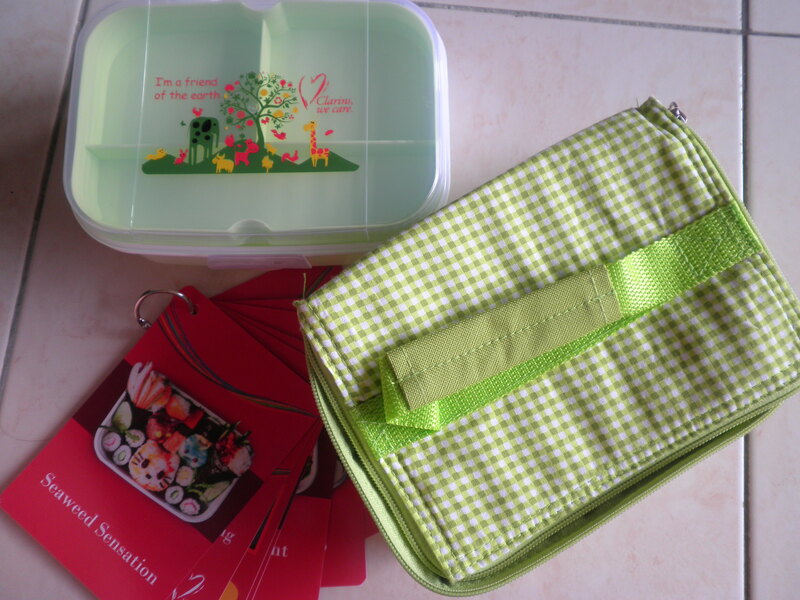 And the great thing about it is that the box came with a bag and the best-est thing is there were cards with suggested bento meals complete with pictures!!! Isn’t that cool? This is a charity sale by Clarins and here’s the picture of my latest great buy!